Although he’s been active in his church and stays busy with family including five grandchildren, Rich soon discovered that working gave him a purpose he has not found elsewhere. That’s why, in his late 60s, Rich unretired and went back to work. 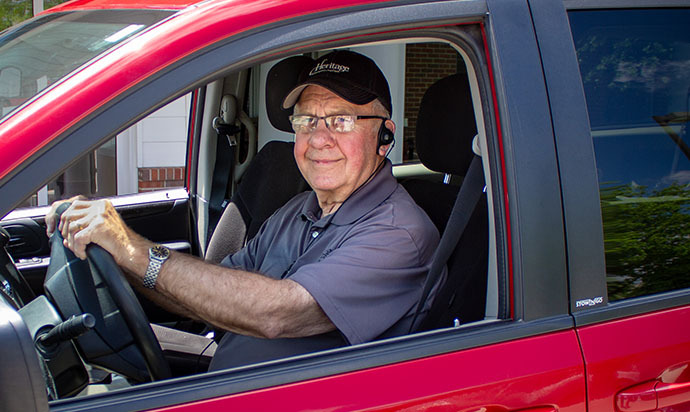 He signed on as a driver three days a week at the Heritage at Shalimar Gardens in Fremont, NE, an assisted living and memory care community, where he transports residents to appointments and runs errands. In addition to a feeling of fulfillment, the part-time job provides extra money and socialization. “You see what everyone is up to,” said Rich, whose part-time schedule coincides with that of his wife Dianne’s three-day-a-week job. The hard-working Midwesterner began his full-time career with Hormel Foods in December of 1967 soon after returning from the Vietnam War where he had been an Army Specialist 4th Class and served as an armored personnel carrier driver at Camp Carroll on the DMZ. In his nearly 40 years at Hormel, Rich spent much of his time on the production line helping in the development of food products, including several varieties of hotdogs such as jalapeno and cheese-stuffed creations. The prestige “hotdog” license plates on his truck pay tribute to his long career at the food processing plant. Sitting around the house wasn’t for him, though, so soon after retiring from Hormel, Rich learned about a part-time groundskeeper’s job at a local college, Midland University. “It was good to get out of the house,” he noted, and mowing 33 acres of grounds was quiet and peaceful. That job ended after six years, with Rich still looking for a way to stay productive. “I still needed that purpose, to get up, get ready and meet new people. You can only do so much around the house. Going back to work wasn’t about the money,” he said, adding that the extra money is nice. 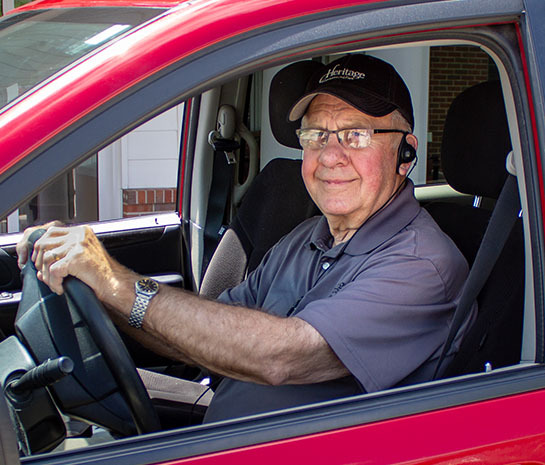 As a driver at the Shalimar, Rich brightens the days of residents, calling to remind them of appointments, and taking them to and from their scheduled stops. “It’s pretty laid back here,” he noted. Rich says he plans to work “until it’s not fun anymore.” So far, there’s no sign of that happening.